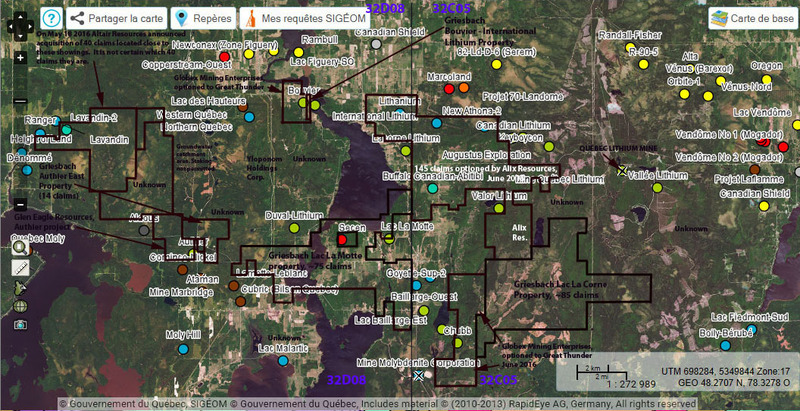 Altair Resources Inc. has signed a letter of intent to acquire the East Authier lithium property in Quebec. The Property comprises 14 claims covering 533 hectares. Although the Property has seen little exploration activity to date it is between and along strike from two lithium deposits. The Property has a “T” shape and extends 3.10 km in the east-west direction and 2.95 km north-south. 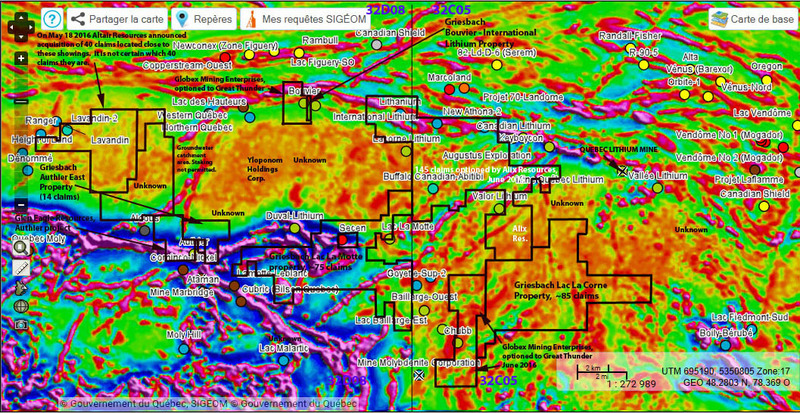 It is located directly between, and along geological strike from, Alix Resources’ (optioned) Duval lithium deposit 6 kilometres to the east and Glen Eagle Resources’ Authier lithium deposit within 1 kilometre to the west. In May 2016 Sayona Mining Ltd. (Australia) signed an agreement to acquire the Authier lithium deposit from Glen Eagle for CAD$4 million. To the north of the East Authier property are a number of map-staking applications made by as of yet unknown applicants. 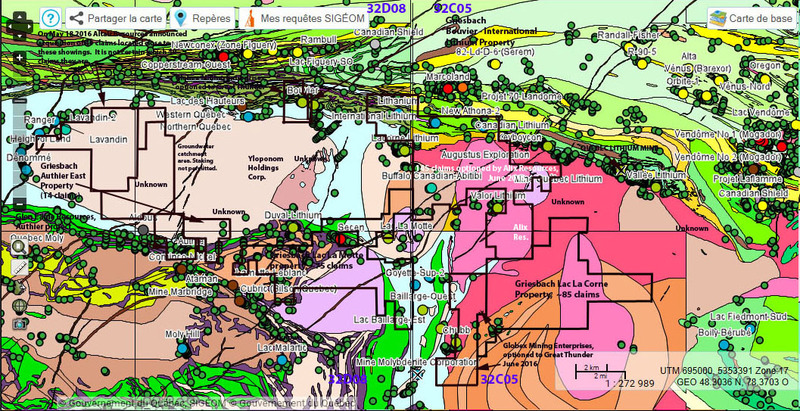 Lithium mineralization in the region occurs in a number of spodumene-bearing pegmatite intrusions interpreted to be genetically derived from the late peraluminous monzongranitic pluton of La Motte located north of the pegmatite. 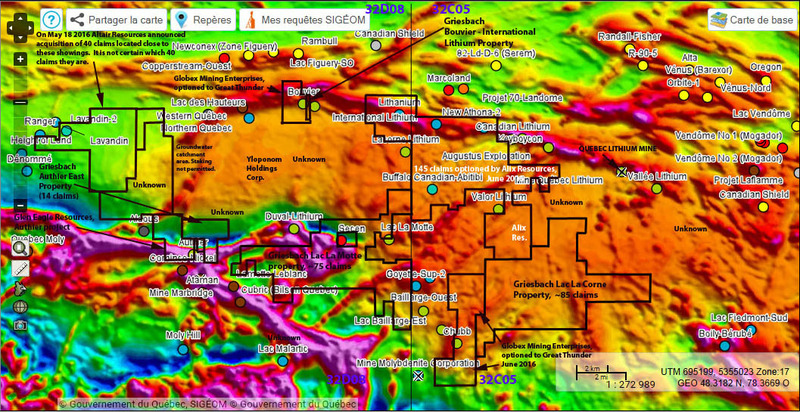 Although the Property has seen very limited drilling, with only two holes recorded, there has been extensive drilling for lithium in the vicinity. 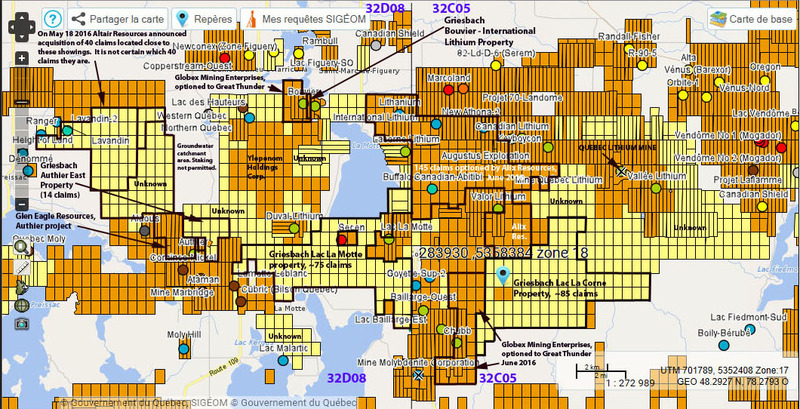 In 2010-2012 Glen Eagle carried out 15,065 meters of diamond drilling, mostly in the immediate vicinity of the Authier deposit. 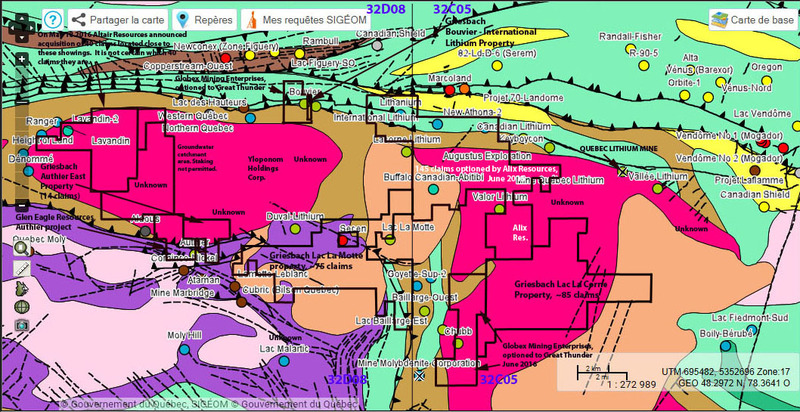 In 1955 Ascot Metals drilled 27 holes in the immediate vicinity of the Duval lithium deposit. $160,000 cash on TSX Venture Exchange (the “Exchange”) approval of which $150,000 can be paid in Altair shares at the market price of the Company on closing with the market price calculated using a 7 day average prior to closing. $100,000 cash due in 180 days after Exchange approval with the Company having the option to pay in shares with the price calculated using a 7 day average prior to payment due date. $100,000 cash due in 360 days after Exchange approval with the Company having the option to pay in shares with the price calculated using a 7 day average prior to payment due date. $100,000 cash due in 540 days after Exchange approval with the Company having the option to pay in shares with the price calculated using a 7 day average prior to payment due date. The proposed acquisition is an arm’s length transaction and is subject to a definitive agreement. A finder’s fee is payable on this transaction at an amount to be determined and will be in compliance with the Exchange Policy. This acquisition and related finder’s fee remains subject to acceptance of filings with the Exchange.